Charity at holiday time means more than just putting your change into the traditional red buckets at the entrances to big-box stores. Needs at the holidays are even more pressing on families, with cold weather approaching and stress over whether they can provide any sort of meaningful holiday for their loved ones. 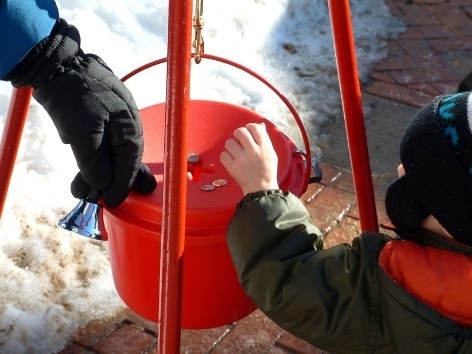 While traditional holiday charities such as the Salvation Army are fine places to contribute your charitable income, there are other options for giving your money...and your time. In some cases, the time is even more precious than the money. Pantries/Food Drives - Thanksgiving and Christmas puts tremendous stress on food pantries. They are often pushed to the edge of their resources. Consider donating cash as well as food items so the pantry can purchase holiday-specific items such as Thanksgiving turkeys. You can help even more by contributing again immediately after the holidays. January is the toughest time of all for contributions, and needs do not go away after the holidays. Soup Kitchens - Donations of cash, food, time, or all three are welcome at the holidays. Soup kitchens generally serve overflow crowds at Thanksgiving and Christmas, and they may need help with not only cooking and serving, but also with cleanup, seating and other chores.Don't just show up on Thanksgiving asking how you can help - you may just add to the chaos. Call well in advance to find out the best way that you can help. Donation Programs - Toys for Tots and similar programs have donation bins where you can donate gently used toys, or buy new toys to give directly to needy children. Other programs may be found for refurbishing used toys, especially bicycles, for Christmas gifts.Clothing donations are also vital around the holidays, especially warm clothing for those who live in colder climates. Winter coats, sweaters, and boots/shoes can make a huge difference for someone in need. The holidays are a great time to clean out your closet and donate while you organize. Meal Delivery Programs - Meals on Wheels and other meal delivery programs help bring meals to seniors who have mobility concerns. While they are always looking for volunteers to help deliver meals and check in on independent seniors, it is especially important during the holidays for seniors who may find the holidays an unusually lonely time. Nursing Homes - A friendly face can bring extra cheer around the holidays to nursing home residents who may not have many visitors or contact during the holidays. You can really brighten a senior's day with some simple companionship. Angel Trees - Angel trees are common in workplaces, schools, and churches as well as relief organizations such as the Salvation Army. The trees will have the names of needy children and/or families that are requesting gifts for the holidays. Simply pick a name (or names) off the tree and supply the needed gifts. While the term Angel Tree has become somewhat generic, an actual Angel Tree program helps provide Christmas presents to the children of the incarcerated. It is another organization worthy of your consideration. These are just a few of the possibilities - if you search within your community, we are sure you will find many other options for donating your holiday resources. Even more importantly, you may find a cause that you wish to continue to support with your time as well as your money. Charitable contributions are highlighted during the holidays, but the needs of the community last throughout the year. Please do your part to help meet them.